This recipe is for the ages 21+.This post contains affiliate links, please see our Site Policies for further information. Early this week I mentioned how my Father and I share a bond off dirty martinis. What I really should have said is that my Dad figured out how to make a killer dirty martini and then sucked me into martini world shortly after. Thanks for that, Dad. The key he found is in using garlic stuffed olives. Yes, use the brine for it, and re-stuff those olives with blue cheese. (If you missed my blue cheese feta debacle on SnapChat the other day you missed gold. SC : Elle_Talk) Why is stuffing your own olives better? Most blue cheese olives are left in oil which is the last thing you want in your martini. For an example in the photos on this post, I used the exact olives I’m telling you not to use. You can see oil floating on top. Gross right? Stuffing the olives yourself adds garlic flavors to the mix but also a freshness you can’t get with jarred or deli counter olives. Hence, why this will be the best classic dirty martini you will ever have. I know I know, I make you guys work for your cocktails. Here is an olive stuffer to make your life easier. Olive Stuffer. To make life even easier for you. If you can’t find garlic stuffed olives. Take a jar of regular olives, remove half the olives, and add in 3 cloves of garlic. Let sit for 48 hours. So in honor of National Martini Day and Father’s Day around the corner, I’m sharing our current tried and true dirty martini recipe. If you like your martini extra dirty like I do, I’ll be leaving a note in the recipe box on what to change. gin martini lovers, you know what to do. Ignore the Vodka and make it with your favorite gin. I don’t like gin martinis but I have to admit in this recipe they are damn good. 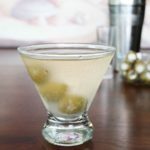 A Lynch family tried and true dirty martini recipe that uses garlic stuffed olive brine with blue cheese olives for a cocktail explosion. In a shaker filled with ice add in your vodka, brine, water, and vermouth. Shake vigorously for 30 shakes. Strain into a chilled martini glass. Removed the garlic from the garlic stuffed olives (put back in garlic olive brine) and stuff olive with blue cheese. Garnish with three on top of your martini. EXTRA DIRTY MARTINI Remove the water from the recipe and use 1 jigger of brine. Keep the instructions the same after that. This recipe is really easy and a classic. Which makes it part of the must know cocktails. So go forth and shake up a few of your own dirty martinis in our honor. Let me know down below how you like your martinis! Dry, Extra Dry, Gin, Dirty, Extra Dirty or Classic? These olives are amazing! I think I always overdue the vermouth so next time I’ll just put it in a spray bottle and spritz the glass. Thanks for garlic olive brine tips. I will definitely be making these again soon! I’m so glad you love the olives and the martini recipe, Tasha! You can also use a coating method with the vermouth. Take the glass you are going to put your martini in, add the vermouth to it. Give the vermouth a swirl to coat the glass and then toss out the excess vermouth that didn’t coat the inside glass. I’ve started doing this recently and it’s made my martinis a lot more consistent in the vermouth. Cheers! That’s why we love it too, Stephanie! So glad you enjoyed it! So glad to hear that, Carol! Enjoy! OMG!!!! The best Dirty Martini I have ever had. The garlic stuffed olive brine and the blue cheese stuffed olives, that I stuffed with stilton, are ingenious! Thanks so much for sharing this recipe. Thank your dad for taking the time perfecting this cocktail. Thank you Tawnee’ Poindexter! I’m glad you have enjoyed this cocktail. It’s still a family favorite of ours! I’ll be sure to tell him. Cheers! I am a big fan of a good dirty martini!! I cannot wait to try this. I have used garlic and blue cheese stuffed olives, but I know this recipe will be so yummy!!! As a bartender of 25+ years , I am so anxious to try this! Thank you! If you like them really dirty, you’ll hopefully love this one! Please come back and let me know what you think and if you have an adjustments. We’re always open to suggestions! Cheers friend! Hello Margo! I hope you enjoy the martini recipe. I have to be careful with what vodkas I use, more so in high alcohol volume cocktails like martinis, as I’m sensitive to potato and wheat based ones. Corn vodkas seem to be the best option for me so I usually pull towards Titos. Though recently, I’ve been making this recipe with gin more than vodka. I have not tried it with Plymouth but as soon as I need a new bottle, I’ll get it! Thank you for the recommendation! So wonderful to hear from you! I’m so glad you love this recipe and it’s converted you to being a martini drinker. I just love hearing stories like this, so thank you for sharing. Cheers, friend! I’m so glad you enjoyed it! Cheers, friend! I love these suggestions, Dan! Thank you for sharing. I look forward to trying these out. Especially the onion with the blue cheese. Cheers! Great recipe! I found a garlic and jalapeño stuffed olive in which I use the brine from that to make the martini dirty. Chilled Tito’s vodka and you have heaven in a martini glass…Thank you! Susan, so glad you like the cocktail! I have had some many recommendations to try it with the addition of jalapeno that I must try it now. Hope you come back to try more cocktail recipes! Everyone is talking about how wonderful the brine is ,but what I really find amazing is your recipe is the first I found that adds half a jigger of water to it and I think that is the beauty of this recipe. I never thought to do this! Silly right? I usually just mix-up up the martini and then throw an ice cube in to dilute it but this sounds like the way to go. Not silly at all! Normally in cocktails shaking or stirring it with ice will dilute it down enough however, over time we just found adding a touch more made it perfect. Hope you like it! I'm the blogger talking a lot behind Elle Talk. My place on the internet where I go to stretch my creativity into delicious recipes and entertain through the stories I tell. Subscribe my Newsletter Recipe & Life Updates! amazon.com and affiliated sites at no cost to readers.